A lesson from a ghazal and its singer’s Life! You have only two options in Life – either enjoy the moment or endure the moment! I recently stumbled upon old recordings of some live concerts of Jagjit Singh and Chitra Singh on YouTube. 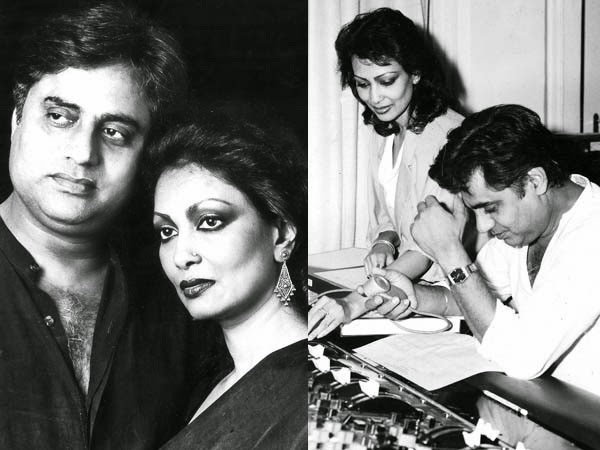 Hearing both Jagjit and Chitra sing together is mesmerizing. But we have to make do with only recordings. Because Chitra stopped singing 24 years ago when their only son Vivek died tragically in a road accident in Mumbai in 1990. In 2009 Chitra’s daughter Monica Dutta, from her first marriage, committed suicide. And in October 2011, Jagjit too passed away. Talking to Filmfare’sFarhana Farook two years ago, Chitra had said: “When I lost Baboo (Vivek’s nickname) the question ‘why me’ would bother me. Not anymore. Spirituality changes your thinking. There has to be a reason whether I understand it or not. Any other woman in my place would have crumbled or become bedridden. But I didn’t allow that to happen. Because I don’t have the luxury of indulging myself. Also, I’m not scared of death. I welcome it this moment…Since Vivek passed away, there was this thing between my daughter, Papa (she called Jagjit by this name) and me as to who would meet him first. Both of them have beaten me to it! Everything in Life is momentary – yaa jee lo, yaa jhel lo! (enjoy the moment or endure it!) Manzil na de, charag na de, hausla toh de...” The last line of Chitra’s quote is actually the opening line of a famous ghazal (you can listen to the original here) that Chitra and Jagjit used to sing. It means, “If you can’t show me the destination or show me the light (for the way), at least give me the strength to endure”. I can completely relate to Chitra’s grief; she’s seen enough pain for a lifetime but her spirit – though I disagree with her decision not to sing anymore after Vivek’s death – remains unbroken. And that’s my key takeaway. Life deals with each of us in our own ways. We have our own stories of love, loss, death, betrayal, hurt and grief. When you reflect on the nature of Life, you will realize that there’s really no point getting bogged down if your Life does not go the way you planned for it. Yes, there will be suffering when there’s pain. But you have to overcome that suffering by accepting the pain. As Chitra realized, and shared, there’s no point in asking “why me”. If something happened to you, it happened. Period. Asking “why me” or “why me now” will not undo what has happened. It was in this “why me” phase that Chitra perhaps resolved never to sing again. We can learn from her Life that such a choice was avoidable. Because what happens when we choose, in times of grief or intense suffering, to forsake what gives us joy, is that we indulge in self-martyrdom, self-pity. And that can be debilitating; it will only increase our suffering. Someone like Chitra sang not to earn a living. Music was her Life. It was who she was. Resolving not to sing was like killing the music within her. Whether it is music or art or your chosen vocation, never try to sacrifice who you are just because you believe Life has dealt you a hard blow. As Chitra herself says, thanks to her own evolution through the years, you can either enjoy the moment or endure the moment. There really is no other way. And therefore there’s no point in fighting Life or getting angry with Life for whatever’s happened – or is happening – to you! The learning from Chitra’s story is simply this: whatever it is that you are faced with in Life, learn to accept it. If there is intense pain, accept it and endure it. Only your accepting pain will end your suffering. And if you are content with whatever you have and whatever is, enjoy each moment. Don’t wish that your Life is any different from what it is now. It is pointless. If you must at all ask for anything of Life, from Life, ask for the strength, as the ghazal goes, to endure it! Author AVIS ViswanathanPosted on November 2, 2014 March 14, 2016 Categories Art of Living, Filmfare, http://schemas.google.com/blogger/2008/kind#post, Inner Peace, Intelligent Living, Jagjit Singh, Manzil Na De Chirag Na De Hosla To De, YouTubeLeave a comment on A lesson from a ghazal and its singer’s Life!